This gorgeous little recipe is perfect for Christmas, New Year's, or Mother's Day morning because all you have to do when you want to eat is assemble and bake. Serve the scrambled eggs in pastry with a choice of toppings that complement the dish and will please different palates: crisply cooked crumbled bacon, caviar, salsa, chopped chives, and chopped green onion. Preheat the oven to 400 F. Unfold the puff pastry sheet, and place it on a work surface. Cut the pastry into 9 equal squares, following the fold lines, using a sharp knife. Turn two muffin tins upside down, and drape the pastry squares over alternate cups (to give the pastry room to expand). Gently press the dough to form around the cups. Bake for 4 to 6 minutes or until the pastry is set and very light golden brown. Let cool for 3 minutes then invert the pastry shells onto a wire rack to cool completely. Cover, and let stand at room temperature up to 24 hours. Using 1 tablespoon butter, grease a 1-1/2 quart baking dish; sprinkle with the Parmesan cheese, and set aside. In a large bowl, combine the eggs with the heavy cream; beat until frothy. Melt the remaining 2 tablespoons butter in a large saucepan over medium heat. Add the eggs to the hot butter; cook, and stir until the eggs are set but still moist. Remove the pan from the heat, and fold in the Alfredo sauce; do not combine completely. Place the egg mixture in the prepared baking dish. Cover, and refrigerate for up to 48 hours. When you're ready to eat, preheat the oven to 350 degrees F. Place the pastry cups on a cookie sheet. Sprinkle the egg mixture with salt and pepper, and fold in gently. 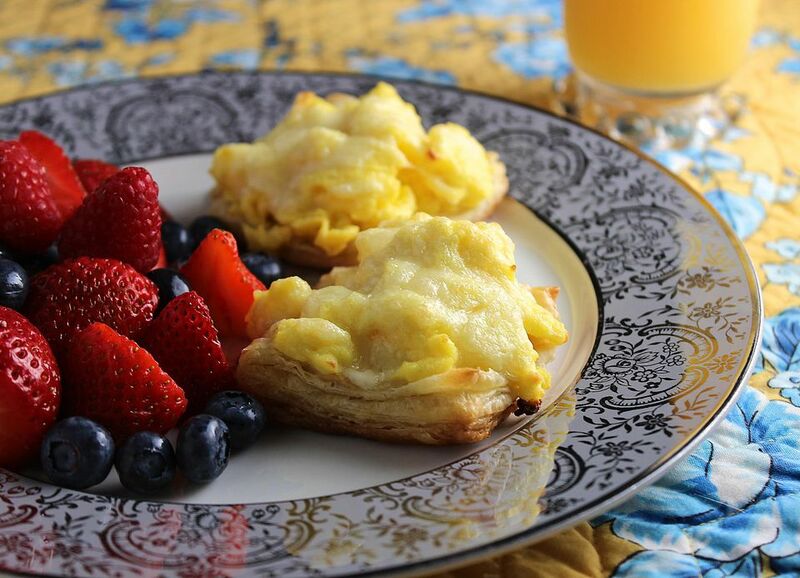 Spoon the egg mixture into the pastry cups, and sprinkle with the Swiss cheese. Bake for 22 to 27 minutes or until the eggs are hot in the center (160 F on an instant-read thermometer), and the pastry is deep golden brown on bottom and edges. Offer a selection of toppings, and let each diner choose for him- or herself. Omit the puff pastry shells, if you'd like. Make the eggs as directed, chill, stir in the salt and pepper, and sprinkle with Swiss cheese; bake the eggs at 350 degrees F for 30-35 minutes until a thermometer registers 140 degrees F.
You can also bake this recipe immediately. Cook the eggs completely, fold in the Alfredo sauce and salt and pepper. Spoon the egg mixture into the cups, sprinkle with the cheese, and bake for 15 to 18 minutes until hot. Serve immediately.